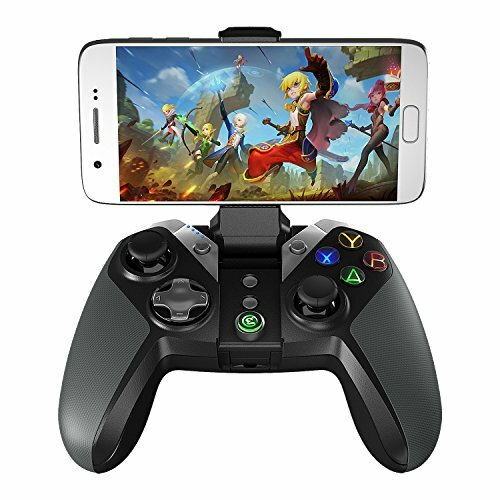 1.GameSir G4s game controller is the fourth generation of GameSir, compatible with android devices and windows PC, connect by bluetooth 4.2, 2.4GHz wireless USB dongle and wired. 2.New design of the build-in adjustable bracket and USB dongle. Rechargeable battery can last 18 hours playing time. As well as the ergonomic design and the rubberized handles bring comfortable gaming experience. 3.The dazzling LEDs lights inside buttons, feels awesome to look, and allows you to play games in dark environments. The brightness of the LEDs can be adjustable as you like. 4.G4s makes the vibration intensity and vibration frequency adjustment becomes reality. Press Clear + Up/Down button of the D-pad to choose the higher/lower vibration frequency. 5.G4s also features changeable position of D-pad. Press Clear+L3 to exchange the position of left joystick and D-pad. Play the games in the way you like. ✔ Compatible with Bluetooth 4.2 / 2.4G Wireless / USB wired connection, working great with Android 4.0/ Windows 7 and later versions, applicable to Android smart phones/ tablets/ Smart TV/ TV BOX, Windows PC, Steam, Steam link, PS3, and Samsung Gear VR, a broad range of games are supported. ✔ Ergonomic, and attractive design with top-toughened materials, brief and smooth streamline, it feels firmly, and comfortable to your palm with the texturing in the surface. The layout of the buttons is so humanized as to operate fluently and efficiently. ✔ Portable built-in bracket with two adjustable angles (110 degrees & 150 degrees), can be used as an individual mobile holder for 3.5~6-inch smart phones. Built-in detachable USB wireless dongle, in case of the small but important thing lost without attention. ✔ Analogue sticks have 360-degree positioning with ultra-accuracy and almost no handle dead-zone. The button life is more than 2 million times. The trigger adopts of metallic design, with dazzling shape, avoid slippery when sweating. Firm bumpers and responsive pressure triggers allow you perform great in car racing and drifting games. ✔ Changeable position of D-pad & the left joysticks, Play the games in the way you like. Adjustable vibration intensity allows you to have a real feedback in different scenes of games.Chargeable battery can last 10 hours for Max Power while 30 hours for Min Power, stand-by time can last at least 12 months.